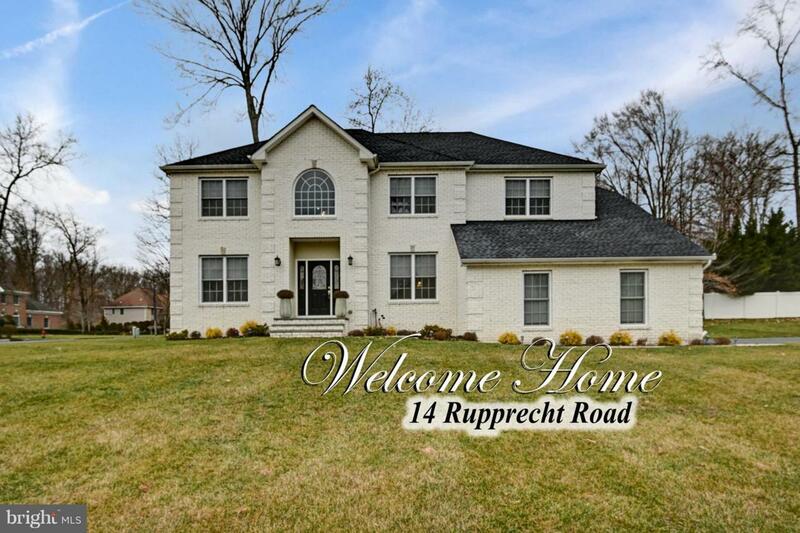 This magnificent home features a well-designed floor plan with sunny, spacious rooms with plenty of windows, high ceilings, neutral wall color, and exquisite custom upgrades and finishing touches~plus room to expand! The attractive, brick facade, front door (and sidelights) with beautiful glass detail inlay, and large Palladium window add charm and elegance to the exterior. Inside, the 2-story foyer has stunning hardwood floors that flow up the staircase, (which boasts handsome wrought-iron balusters), and continue throughout the first level. Crown molding in the generous size formal living and dining rooms add the perfect finishing touch. The 2-story living area and the gourmet, eat-in kitchen coincide together to create an open flow, perfect when entertaining. A stunning feature wall is created in the living area with unique, floor-to-ceiling stone surrounding the fireplace, which is flanked by multiple windows. Abundant storage space is found within the beautiful custom cabinetry, center island, and pantry in the kitchen, which also provides sleek granite counters, SS appliances (including a double oven), a stove with stone backsplash reaching up to the ceiling, and a good size dining area with sliding door access to the backyard. A full bathroom is a bonus to this level! Upstairs, the hallway overlooks the living area and leads to the spacious master suite complete with tray ceiling with recessed lighting, and ample closet space. The luxuriously updated master bath provides a generous size double vanity with granite counters and dual sinks with modern faucets, soaking tub, and oversized shower with jets. There are 3 additional good size bedrooms on this level, all with ample closet space, windows, and ceiling fans. The main bathroom offers an attractive vanity with dual sinks, granite counters, stylish lighting, faucets, and flooring. Don't miss the partially finished basement, updated with easy-to-maintain laminate wood flooring!